Trout fishing and fly tying. I live in California and the fishing in this state is outstanding. From Trout and Salmon to Bass and Crappie, it has been the best two years of fishing of my life. LOTS of water this year, rivers are raging. Next on my list is Kokanee and Stripers. Crappie are starting here in California. Averaging about 13" with about half 15". Pretty much like Missouri Crappie and taste the same. I have only tried a white crappie jig tipped with a piece of worm on a lake I fish. Always works. I did tie a fly with squirrel tail and weighted with those eye weights. I did catch one nice one on that but VERY difficult to cast. DSCN1961.MOV Here is a fun video of a small clean out of our sluice box. Fishing and Gold in California. Life is good. Since moving to CA, the fishing has been OK to pretty good. Rainbows, Browns, Brookies, and Goldens. This past week I caught my 2 biggest trout of my life, a 21" and 24" with several 15 to 17". The biggest all came on the Thompson Bouyant spoons. Lost one big one on the fly rod. 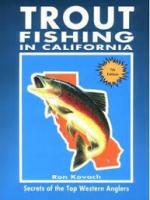 We now live in Sonora, CA and have access to some great fishing within 30 minutes of the house. Within 2 hours we can reach more than I could possibly in my lifetime. I have always had good luck swinging Soft Hackles. Simple fly. The Walleye fishing on Stockton is the only thing I miss since moving to California last April. 18 to 20 feet with a 3 way rig and crawler harness fished just fast enough to spin the blade and tick the bottom with your weight works nearly year round. Stockton is an EXCELLENT walleye fishery. NO Walleye in California!